Dedrone is the international market and technology leader in drone detection. Dedrone is based in San Francisco, California, and was founded in 2014. Dedrone provides an automatic, integrated and self-contained drone detection, identification, and counter-measures platform to defeat drone threats and their operators 24/7. Its automated, software-based aerial intrusion detection platform, DroneTracker, provides early warning of illegal civilian UAVs and is used to protect industrial plants, government buildings and other critical infrastructure installations against smugglers, spies, and terrorist attacks. Dedrone’s RF Sensors form the foundation that enables robust security to protect against drones. Dedrone alert to potential threats even before they take off the ground, and measurement-grade RF technology pinpoints the locations of drone and pilot. RF Sensor is the cornerstone of airspace security, and detects commercial, consumer, and homebrew drones. Modern security requires a layered approach that keeps up with the evolution of drone technology. 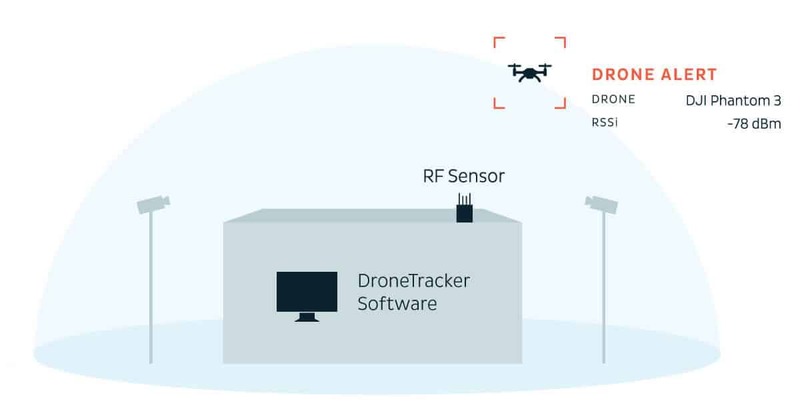 Sensors connect to DroneTracker software, which detects, classifies, and protects against drone threats. Passive and active countermeasures can be triggered, tailoring the defense mechanism to the severity of the threat. Dedrone’s RF Sensor is purpose-built sensor for airspace security and collects hard data on drone activity in the airspace. It detects all kinds of drones and has a coverage range over over 1 mile in ideal conditions. Machine-learning video algorithms for detecting and locating the position of drones are key parts of airspace security. Using feeds from high-resolution video cameras, DroneTracker software distinguishes between drones and other moving objects, and plots the position and flight path of a drone on map. Dedrone sensors and integrated external video cameras record forensic evidence of drone intrusions. A combination of forensic data is automatically captured by the DroneTracker software, including drone manufacturer, model, time and length of drone activity, and video verification. Summary reports are automatically produced and available on-demand for easy analysis of the most critical airspace security data. Multiple layers of security can added by integrating sensors such as radar, infrared, or acoustic devices. When layered on top of the Dedrone RF Sensor, these additional sensors add extra layers of information, extending detection range or adding capabilities to the system. Passive and active countermeasures can be integrated into the Dedrone solution, depending on needs and capabilities. Together with detection from sensors, they secure the airspace security around your facility.